Could stimulating the brain one day treat Alzheimer's disease? In a very small group of patients, sending electrical impulses to a memory-center in the brain - via tiny implanted electrodes - may have improved their memory. The new study provides hope, albeit a small glimmer, that deep brain stimulation could one day help patients diagnosed with early Alzheimer's disease. "Can this be used for cognitive or memory enhancement with patients with serious memory impairment?" said Dr. Itzhak Fried, a study co-author and professor of neurosurgery at the David Geffen School of Medicine at UCLA. "This is a question not answered by this study, but this study points to a possible direction for the future." In the study, published in the New England Journal of Medicine, seven epilepsy patients with electrodes already embedded in their brains (they were being monitored for spontaneous seizures) were asked to play a video game to test their memory. During the game, the patients navigated a virtual world, delivering people in a taxi to various shops. Patients who had a memory center in the brain - called the entorhinal cortex - electrically stimulated while navigating the virtual world were able to reach the shops quicker, and in some cases found shortcuts, compared with those who were not stimulated. The entorhinal cortex is a sort of processing center in the brain, funneling everyday information - for instance, who you are meeting for lunch tomorrow - to the hippocampus, where lasting memories are formed. The suggestion made by this study is that stimulating the entorhinal cortex while performing a task may help to cement memories. "We're stimulating a critical node of a very complex network, but how exactly it works we do not know," said Fried. And it is not yet known whether this stimulation will work with a wider swath of memory-impaired patients. Deep brain stimulation is now used to treat Parkinson's disease; small studies have also suggested it may be useful for treating obsessive-compulsive disorder, and major depression. A study published recently in the Annals of Neurology found that constant stimulation of another memory pathway, called the fornix, may have sparked neuron growth and slowed down cognitive decline in a small group Alzheimer's patients. 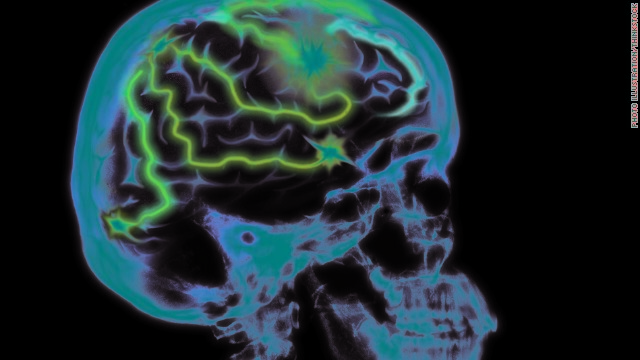 But most deep brain stimulation studies are small (besides, implanting electrodes in the brain is invasive and often a last-ditch effort to treat a disease), so this most recent study's authors and outside experts emphasize caution when interpreting results. "This study gives us more things to think about and more possible ways to intervene," said Dr. Rachelle Doody, an Alzheimer's disease expert unaffiliated with this study, and spokesperson for the American Academy of Neurology. "But right now it's interesting science, not medicine and not a treatment." So will the next step be for companies to push for classification of a new disease, "Memory Impairment Neuroelectric Deficiency Syndrome" (MINDS)? Then they can lobby the FDA to sell electric shock helmets to parents for their kids who struggle in school. And it won't stop there; the devices will be a big seller to parents who want their kids to test well and get into Ivy League schools. Let's be very careful about zapping people's brains. In fact, forget it. Ha ha. No, if the cure is not in easy-to-swallow pill form it won't be popular with the general public. No one likes electric helmets (maybe scientoligists) Btw do you know anyone who has alzheimers? It is horrible. You would try anything if your mother or father had it. Stop government sanctioned terrorism against medical marijuana patients. For God’s sake please STOP. This is ironic. A cruotny that refuses to use the death penalty even for serial killers condemns the young and elderly to die by purposeful neglect. Being ruled by Liberals and Progressives doesn't result in a very caring, nurturing society, does it? We may want to be careful about zapping people's hearts too...oh wait, theres already a machine for that. Great news! There is virtually nothing out there today to stop this devastating disease. EVERYONE should be focused on finding a cure. For those with little empathy, but interested in reducing our deficit, this disease alone will bankrupt our medicare system in 20 years. 50% of people over 84 years of age will have some dementia per a recent study. Healthcare costs, nursing care, and related medical expenses will skyrocket . We need to make its cure a major priority. The article, as usual, fails to mention the MOST successful use of DBS, for a condition 8x more common than Parkinson's – Essential Tremor. My wife had this done for her very severe (bedridden) Tremor in 1998, only the 2nd woman in the U.S. to have it done. The day after the surgery, she RAN down the hospital hall, tremor free! Try it on the republicans first. They do not remember what they said, after they are elected. Insert memory joke here -----, e.g., "I was going to reply but forget what I was going to ..."
Great to hear that this could be done in a one day treatment. Thanks for sharing the news.